In another installment of "Roots", I found that the Quidley family, to whom I am directly related and who settled on Hatteras Island in North Carolina's outer banks first came to the New World in the 1680's, on the Brigantine, Gull, out of Portsmouth, England. The ship's master, Patrick Quidley, established a base for himself by transplanting family members as colonists. Though the mists of time hang heavy over precisely what the 'colonists' intended to do, their subsequent actions speak for themselves. Patrick Quidley's brush with the law is recorded in the book, "The Admiralty Sessions, 1536-1834: Maritime Crime and the Silver Oar". "Dr. Fisher Littleton presided over the Admiralty court and took the view that those who adhered to James II were “not enemies, but rogues”. The prosecution proceeded at the Admiralty Sessions held at the Marshalsea in February 1694, even though the nine accused men asserted that they fought under a lawful commission issued by James II. At these hearings, Captain John Golden and Thomas Jones were convicted for treason and Patrick Quidley and Darby Collins for piracy. 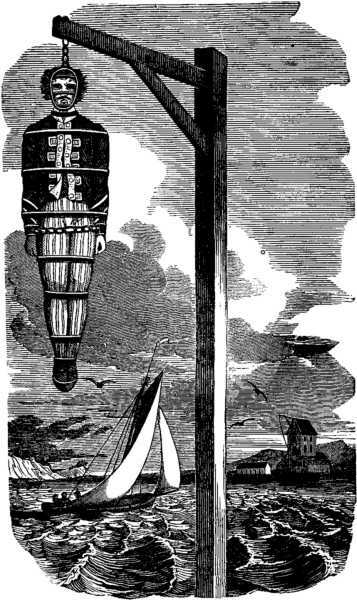 On March 5, 1694, they were hanged."